An extended version of this paper was presented at the ECOFIN meeting in Luxembourg on 11 September 2015. Click here to download it. Source: Bruegel based on OECD (2015) and Standing Committee on Finance (2014). Climate change is already affecting our environment: Global average temperatures have risen by almost 1°C above pre-industrial levels. Sea levels have risen by 19cm since the beginning of the last century. The frequency of extreme weather events has increased. Water cycles and certain ecosystems are affected1. Climate simulations show that temperature increases will be different in different parts of the world2. In some vulnerable regions, more extreme temperatures and desertification could trigger migration3. The EU might also be directly affected by substantial increases in droughts and extreme heat phenomena in southern Europe by the end of the century4. The scientific consensus is that this temperature increase is very likely the result of man-made emissions of greenhouse gases (GHG)5. The concentration of CO2 in the atmosphere has increased by about 2 parts per million (ppm) per year since 20026, passing 400 ppm in 20157. Baseline projections suggest that without mitigation, the average global temperature could increase by more than 4°C by the end of the century8. Ethical: Climate change will hit the poorest parts of the world’s population hardest9. It will also affect future generations much more than current generations. Ethical considerations call for the preservation of the common good of an intact environment10. Risk management: climate change affects a complex system that we do not fully understand. Research has indicated the possibility of potential vicious cycles (such as release of greenhouse gases from melting permafrost) and threshold events (such as a shift in the Gulf Stream). Global warming remains a large-scale experiment on our planet with uncertain outcomes. Irreversibility: climate change is a slow-moving but long-lasting phenomenon that humans cannot easily stop when its effects turn out to be severe. Even after a complete stop of man-made greenhouse-gas emissions, the stock of greenhouse gases in the atmosphere will continue to cause global temperature increases for centuries. Expected economic cost: There is a consensus that above a certain temperature level, climate change will have significant economic costs – but there is no consensus on how big this cost will be11. Addressing climate change involves both adaptation and mitigation. Adaptation policies to cope with the consequences of global warming are primarily carried out by local or national authorities and do not require global cooperation. Mitigation is all policy action aimed at limiting global warming. Mitigation is a truly global challenge because action by countries acting alone would be largely ineffective. Reduced fossil fuel consumption in a few participating countries would lead to lower fossil fuel prices. Countries that opt out would hence increase their production/exports (of energy-intensive products) based on highly competitive fossil fuels, largely off-setting the greenhouse-gas reductions in participating countries. The optimal balance between mitigation, adaptation and endurance is uncertain. In an optimal scenario, the overall costs related to climate change will be spread relatively evenly across all three12. To achieve the politically-set goal of limiting global warming to less than 2°C above pre-industrial level, global emissions must be cut drastically. The IPCC (2014) translates the target into a CO2 concentration of less than 450ppm. Achieving this goal will essentially require the total decarbonisation of our economies in the twenty-first century. A low-carbon economy requires a completely different investment profile to business-as-usual. First, most of the cost will be up-front because the investment cost for low-carbon technologies tends to be higher, while variable costs tend to be lower. According to IEA (2014), US$53 trillion in cumulative investment in energy supply and energy efficiency is required between 2014 and 2035 to get the world onto a 2°C emissions path (IEA, 2014). Second, many low-carbon technologies required for deep decarbonisation are still in their infancy and require substantial investment in research, development and demonstration. Third, the overall cost of the energy system will be higher than under business-as-usual (if one does not price in the climate externality). Estimates of the additional cost of achieving the 2°C target range from a 3 percent to 11 percent loss of annual consumption in 2100 compared to the no-mitigation baseline13. The impact on GDP could also translate into a significant impact on public finances. Research has also started to examine the potential consequences for financial stability of both decarbonisation and climate change14. Most economists argue that appropriately pricing emissions is the most efficient way of achieving de-carbonisation. Pricing carbon would change consumption, investment and innovation decisions. Carbon taxes and cap-and-trade schemes are two ways of achieving this goal15. It would be most efficient if this price is the same for all countries and sectors. Gollier and Tirole (2015) suggest that all countries should agree to a minimum carbon price because the current system of countries making individual emissions reduction pledges (Intended Nationally Determined Contributions or INDCs) will fall short of what is needed. They, however, acknowledge that in this case transfers will need to be organised to enable an ambitious deal. At the climate conferences in Copenhagen (2009) and Cancún (2010), the EU and other developed countries pledged jointly to provide nearly $30 billion in ‘fast start’ finance to developing countries in 2010-12 to support immediate action. The EU reportedly provided €7.34 billion in fast start finance over 2010-12, slightly exceeding the €7.2 billion pledge made in Copenhagen. This is all public money. At the climate conferences in Copenhagen (2009) and Cancún (2010), the EU and other developed countries also committed to mobilise $100 billion a year by 2020. If the EU’s share is calculated in the same way as its share of the fast-start finance (EU: $9.3 billion of $30 billion), it would amount to around $31 billion per year by 2020 – but so far there is no agreement on the shares of the $100 billion to be paid by individual donors. In contrast to the fast-start finance that was limited to public money, the $100 billion includes all mobilised climate finance, including private money. For the years 2013-19 the decision on long-term finance at the Warsaw COP (2013) “urges” developed countries to ramp-up climate finance to $100 billion in 2020. The Ecofin Council reported that the EU and its member states provided €9.6 billion in 2013. Assuming a linear track towards €31 billion in 2020, this would require a continual scaling up of climate finance by €3 billion per year. There is no formal commitment for the post-2020 period, but the COP21 draft text includes several options for climate finance. What should the European approach to climate finance be? Climate finance – defined as a financial flow targeted at mitigation or adaptation in developing countries – is an important element of the ongoing climate negotiations16. EU finance ministers have repeatedly expressed their commitment to provide climate finance17. They have reaffirmed their commitment to scaling up the mobilisation of climate finance from a wide variety of sources, public and private, bilateral and multilateral, including “alternative sources of finance”. Ministers have also expressed their support for a number of key elements of the ongoing negotiations, such as the role of the Green Climate Fund (GCF) as one of the vehicles for climate finance. EU finance ministers have not yet agreed on precise commitment numbers for Paris, in terms of how public, private resources should be activated, or the main mechanisms through which climate finance should be channelled. Ministers have emphasised the importance of good governance, proper implementation and proper monitoring. So far the EU is a principal provider of climate finance. In terms of pledges to the GCF, to multilateral development banks and in total climate-related official development assistance (ODA) the EU represents more than half of the resources provided by all Annex II countries, while in terms of responsibility and capability it represents fewer than half of all Annex II countries (historic emissions 41 percent; GDP 38 percent). EU citizens in all member states consider climate change as a serious problem18. These shared political preferences, together with the benefits of a common approach, justify EU-level energy and climate policies (such as the ETS and the Energy Union). Because effective action to mitigate climate change requires a global approach it is fair to assume that European citizens would have a (high) preference for getting an agreement in Paris. The 2°C target was reaffirmed by G7 leaders at the June 2015 summit in Elmau, Germany. A global deal will require agreement from developing countries, some of which are most interested in predictable climate-finance flows. Thus a consistent EU position on climate finance would be instrumental for reaching a deal in Paris. Backing up past pledges with taxpayers’ resources and with a proper strategy for private funding would increase the EU’s credibility, while joint EU funding would provide predictable future flows. Source: Bruegel based on: Historical emissions and 2012 emissions: http://cait.wri.org/; Latest GCF pledges: ‘Status of Pledges and Contributions made to the Green Climate Fund’ (August 2015); GDP for 2012 in current US$: World Bank; OECD ODA, 2013: Climate Change: OECD DAC External Development Finance Statistics (*2011). Mitigating climate change is not only a preference for EU citizens. A number of sectors have a competitive advantage in supplying the tools for the necessary transition. For those, fast and deep decarbonisation outside the EU represents an increasingly interesting export market (see Box 2), with a global investment potential of an estimated US$53 from 2014-35 (IEA, 2014). 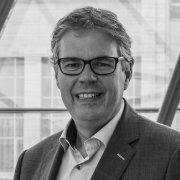 The EU has promised to reduce its emissions by 40 percent by 2030, but this in itself will not trigger sufficient reciprocity from other countries because the EU’s efforts are close to irrelevant on the global scale – EU emissions are already less than 10 percent of global emissions. To promote greater mitigation ambition among its partners, climate finance is one of the EU’s main levers (in addition to capacity building and technology transfer). A joint position would increase the weight of the EU in the negotiations, possibly allowing it to promote higher ambition. Again, the credibility of such a position would be enhanced if underpinned by joint EU funding. A unified position and representation would significantly increase the EU’s ability to shape the emerging international climate institutions and their governance. Small EU countries have only a very limited voice in the governance of international climate funds such as the GCF. Key Ecofin goals, such as ensuring that resources are efficiently and effectively used, with proper accountability and appropriate mechanisms for review, could be more easily defended. The EU could shape the allocation of funds towards an optimal mix of mitigation and adaptation. The EU could also more effectively insist that public climate finance is additional and crowds-in private funding and government funding in developing countries19. Moreover, individual EU countries have too little weight to ensure that climate funds are also used to procure the technologies (eg renewables) and services (eg climate insurance) that they are particularly good at providing. A joint EU representation would ensure that the EU is fairly represented in corresponding discussions. Moreover, climate finance can make decarbonisation cheaper and could save European taxpayers’ money currently used in domestic deployment. The abatement cost in fast-growing developing countries can be lower than in developed countries. For example, building renewable energy generation instead of coal plants in developing countries is cheaper than replacing existing gas-fired plants before the end of their economic lifetime in developed economies. Table 2 shows that domestic deployment is already a significant spending item, of which parts could be used more efficiently to achieve mitigation in developing countries. An EU climate-finance strategy must then define the resources and establish clarity on the mix of grants/transfers, credit finance and private-sector leveraging. Low-carbon energy technologies are expected to capture an ever-growing market share of energy-sector investments, which represent about 2 percent of global GDP20. Non-Annex I countries will – because of their increasing energy demand – be a particularly fast-growing market for energy-sector investments21. For low-carbon technologies, important standards (such as those relating to electric vehicle infrastructure) and system choices (such as which transport fuel to use) are expected to be decided in the coming decade. Promoting low-carbon technologies in which the EU has a competitive edge outside Europe might help to establish European standards and systems globally and thus help reinforce Europe’s competitive edge. Consequently, financing low-carbon investments in emerging and developing countries could help the EU to secure a competitive advantage in growing new, high value-added industries. Source: Bruegel based on UN Comtrade. Note: Climate-related ODA 2013 is based on OECD ODA and covers all ODA with a principal or substantial adaptation or mitigation purpose (includes loans with >25 percent grant element) Subsidies to deployment of low-carbon technologies are based on own estimates of the excess prices of wind, solar and biomass plants deployed in 2014 in the EU over expected electricity costs (key assumptions are a 5 percent discount rate, German electricity forward prices, German new-built feed-in tariffs) – brackets with low and high scenario, show the huge uncertainty of this estimate. Public low-carbon energy RD&D is based on the corresponding IEA statistics. 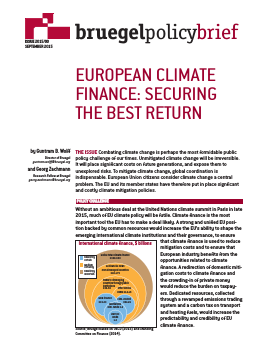 How could the EU generate resources for climate finance? Fiscal resources can, in principle, come from a large number of different sources and are not necessarily functionally linked to the EU’s own mitigation goals. However, it would be advantageous to link own resources to the EU’s mitigation efforts. Two main ways of generating climate finance are conceivable for the EU. The first improves the current emissions trading system and allocates a fixed proportion of the revenues to climate finance. The second consists of a true EU own resource, a tax on carbon, which could be applied to sectors not covered by the ETS. Improving the ETS and using revenues for climate finance? The ETS currently generates about €8 billion in annual fiscal revenues for member states; part of this could be earmarked for climate finance22. The ETS is a functioning instrument that already addresses the distribution issue between member states. Its current revision for the post-2020 period provides an opportunity to inject new ideas. 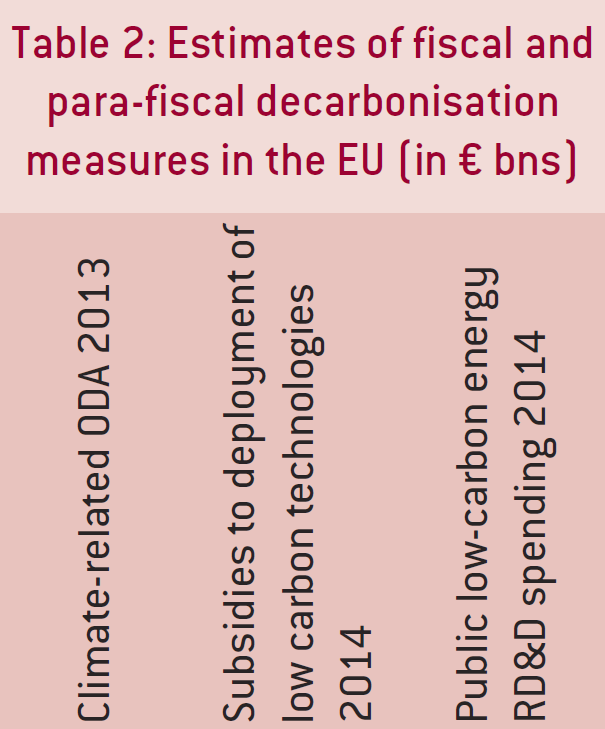 Moreover, when decarbonisation is achieved, the corresponding fiscal capacity would be automatically phased-out. Proposals to raise additional climate finance from the EU ETS include committing a portion of auctioning revenues directly to the Green Climate Fund. Establishing such a funding mechanism would provide a long-term and sustainable way to deliver climate-finance commitments. Some legal precedents for earmarking a share of these revenues for European projects exist. Currently about 2-3 percent of allowances are – in the framework of the so-called NER300 programme – sold by the European Investment Bank and distributed to member states to support a few low-carbon demonstration projects, selected at EU level. The European Commission proposal on the ETS reform foresees expanding this approach after 2020. An Innovation Fund worth 450 million allowances and a Modernisation Fund worth 310 million allowances shall provide funding for dedicated purposes. A similar structure – an EU ETS International Climate Action Reserve – could be designed in order to provide climate finance. The current ETS has been of limited effectiveness but there are instruments to improve it. Its fundamental problem is that private investors do not believe in the policy commitment that the issuance of new allowances will be gradually phased out. As a result, the price of allowances has been too low to effectively change the private sector’s investment and consumption patterns. Financial instruments could make policy commitments more time-consistent23. 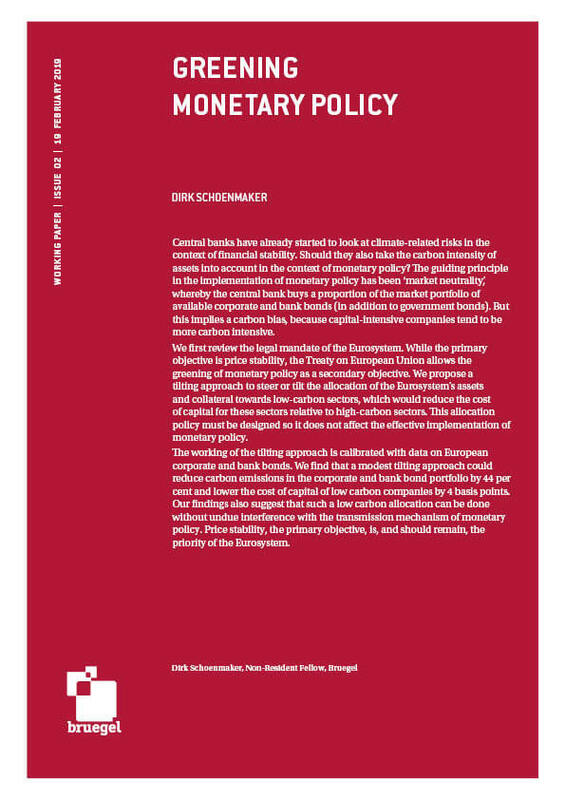 Towards a European carbon tax? The ETS only covers about half of the EU’s emissions and there is growing concern about different carbon pricing in different sectors (for example, electric vehicles pay for carbon through the electricity bill, while combustion- powered cars do not). Consequently, there are good economic reasons for also taxing carbon in heating and transport. Within the internal market, a harmonised tax on the carbon content of transport and heating fuels – possibly aligned with the ETS – would improve efficiency and would also create a level playing field. Article 192(2) of the Treaty on the Functioning of the EU grants fiscal authority to the EU if the aim is to achieve an environmental goal as set out in Article 191. Such a decision would require unanimity of the Council with a special legislative procedure24. This truly European tax could provide own resources to the EU, which could be functionally linked to the climate-finance commitments in the international negotiations. National budgetary sovereignty would be safeguarded by the unanimity requirement. Neither the EU nor its global partners have a clear position on to what degree its current and future climate finance pledges entail transfers/grants, credit subsidies or private-sector investment. This lack of clarity is also reflected in the balance sheets of the international financial vehicles that have been created to channel climate finance. The Green Climate Fund, according to various UNFCCC decisions, should play a substantial and increasing role in channelling climate finance but can only contribute about $1.2 billion per year currently. For the GCF, EU pledges amount to 47 percent of the $10 billion (GCF, 2015). In terms of cost to the European taxpayer, such differences are meaningful25. 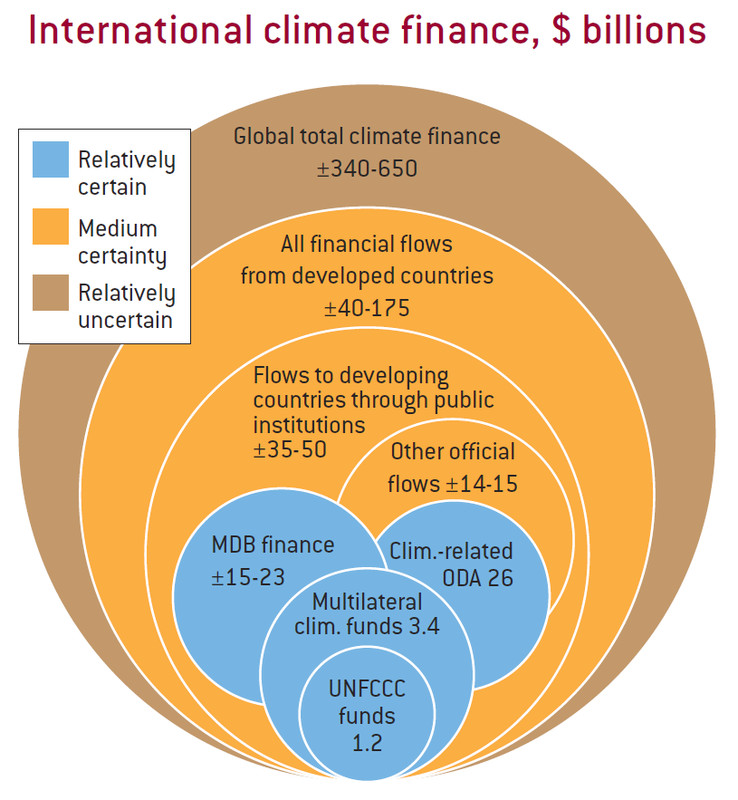 Private financial flows can play an important part in climate finance. The largest part of the mitigation and adaptation costs of trillions of US$ will be covered by the private sector. For this investment to happen, the private sector needs to have stable framework conditions and clear signals that the global strategy will be credibly implemented. The financial system might need further regulatory initiatives and different supervisory structures to provide the necessary amounts of long-term investment capital. Climate finance should not simply replace such funding. On the contrary, public sector guarantee schemes and similar initiatives should be targeted to areas to which the financial system would not provide funding. For example, some countries or sectors might lack market access. Some projects might be considered too risky to fund without a first-loss public guarantee. Public resources will be most effective in crowding-in additional private funding if they are targeted at high-risk projects. To come to a common and united EU position, agreement between member states on sharing the burden of climate finance is needed. The sharing of the mitigation burden (a reduction in emissions of at least 40 percent by 2030) is already determined in the relevant decisions on the ETS and the non-ETS sectors. 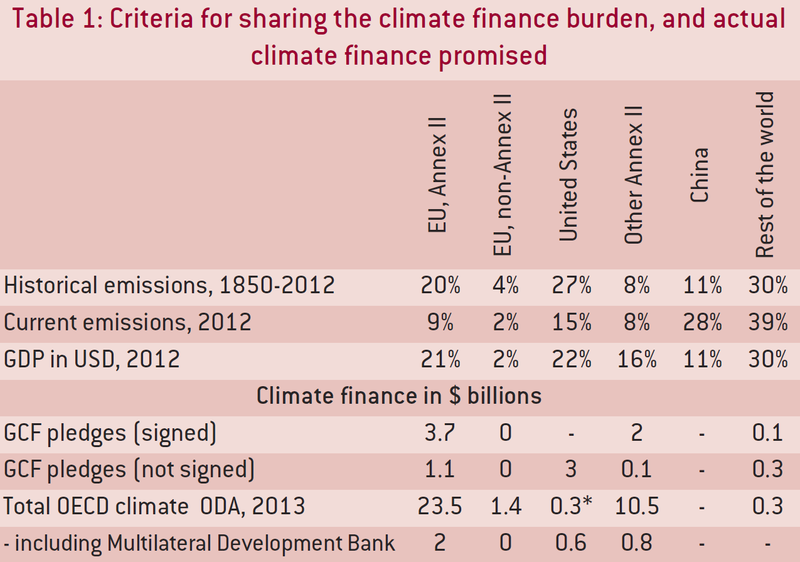 There is no corresponding position on the distribution of the climate-finance burden. Internal EU discussions on existing climate finance pledges need to take into account that some member states are not committed under the UNFCCC. For possible pledges beyond 2020, the EU as a whole should strive to overcome the strict definitions of the 1992 UNFCCC. While this would imply that some non-Annex II member states would also be committed to provide some climate finance (in line with their responsibility and capabilities) it would reduce the overall share provided by the EU. Internal compensation would need to be discussed. An EU approach to climate negotiations and finance would be preferable to member states pursuing individual climate policies, because of the greater ability of the EU to shape the climate agenda, not least to the benefit of its industry, and to meet the expectations of EU citizens. Climate finance is also a way to reduce European mitigation costs. Additional EU resources could come from ETS auction revenues and an EU carbon tax on sectors not covered by the ETS. EU finance ministers also need to discuss the best ways to crowd-in private finance. Burden sharing keys on climate finance within the EU need to be discussed. 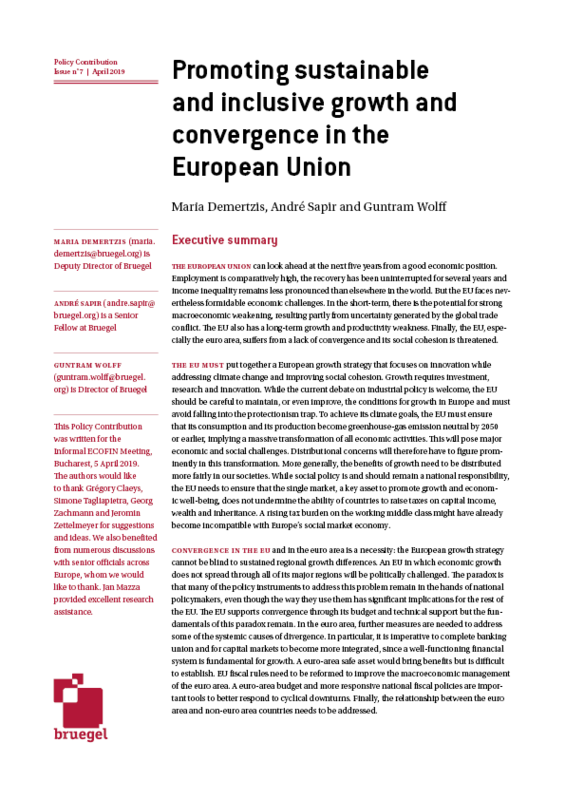 The authors would like to thank Hela Cheikhrouhou and a number of policymakers and experts, André Sapir, Benito Müller and participants at Bruegel’s research seminar. Augustin Lagarde and Domenico Favoino provided excellent research assistance. 1. IPCC, AR5, Working Group I, summary for policymakers. 3. The literature on the size of migration flows induced by climate change is still in its infancy. Piguet (2012) has a useful summary. First evidence that flows can be a direct result of climate change is presented in Kniveton et al (2012). 4. IPCC, AR5, Working Group I, summary for policymakers, p22; an earlier study is Giorgi and Lionello (2008). The European Commission is funding a project assessing the local impact on the Mediterranean (http://www.climrun.eu/ ). 6. US National Oceanic and Atmospheric Administration ESRL; http://www.esrl.noaa.gov/gmd/ccgg/trends/. 7. ESRL (2015) and IPCC, AR5, Working Group III, summary for policymakers, p7. 8. Projections about future increases of temperature are characterised by uncertainty. However, the IPCC establishes an almost linear relationship between cumulated increases in greenhouse gases and global temperatures. See IPCC, AR5, Working Group I, summary for policymakers, p20. 9. See for example Mendelsohn et al (2006). 10. See for example The Vatican (2015). 11. Most models quoted by the IPCC did not simulate a 4°C world. Most estimates of the welfare loss associated with a 3°C warming range from 1 to 3 percent, but one study estimates more than 12 percent. IPCC, AR5, Working Group II, p690. 12. Agrawala et al (2010); without mitigation, the optimal adaptation cost will reach up to 1 percent of GDP in 2100. 13. If we wait or cannot use certain technologies or chose sub-optimal patterns it will be more. Source: IPCC, AR5, Working Group III, technical summary, p58. 14. See, for example, Bank of England (2015). 15. See Goulder and Schein (2013); an important question is what the best inter-temporal profile of a carbon tax would be (Sinn 2008). 16. There are three major mapping exercises of the climate finance landscape. Buchner et al (2014) includes flows between developed countries, Standing Committee on Finance (2014) is closest to the UNFCCC definition and OECD (2015) focuses on official development assistance. 17. 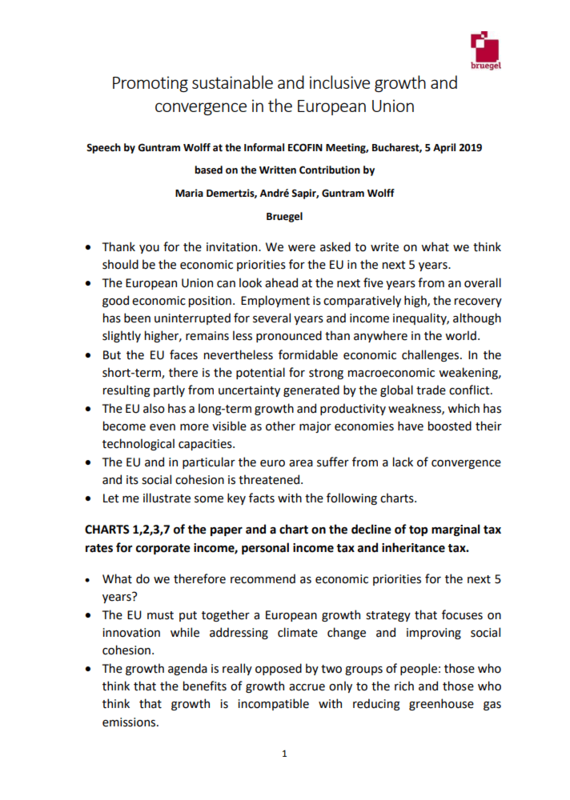 See the Ecofin conclusions from November 2014 (Council of the European Union, 2014) and the conclusions from June 2009 (Council of the European Union, 2009a), for example. 18. In most member states citizen consider it on average as a “very serious problem”. Only in the Netherlands, the UK, Latvia and Estonia the citizen consider it on average as a “fairly serious problem”. European Commission (2014, p23). 19. Jakob et al (2015) warn that, without appropriately designed policies and governance provisions, sizable climate finance inflows might induce harmful effects for recipients. 20. For the years 2014-35 according to the IEA New Policies Scenario. See IEA (2014), p34. 21. Annual non-OECD energy investments will grow twice as fast as OECD energy investments between 2015 and 2035 (33 percent vs. 16 percent). Source: IEA (2014), pp162-3. 22. There are about two billion allowances issued every year, half of them for free and half of them through auctions. At the current price of about €8 per allowance this translates into €8 billion. 23. To restore credibility and to ensure long-term commitment to the ETS, the European Investment Bank could auction guarantees on the future emission allowance price. This will reduce the risk for low-carbon investments and enable stabilisation of the ETS. For a detailed proposal see Zachmann (2013). 24. 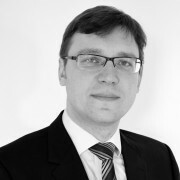 We would like to thank Christian Waldhoff of HU Berlin for an exchange on this matter and sending his forthcoming paper, which includes a related discussion. 25. Transfers represent the largest cost but may also be the most effective sweetener to achieve a global deal. In turn, loans from public banks will be most relevant for those countries that lack proper access to global capital markets. Private sector investments, in turn, involve little or no public resources but can be influenced by regulatory initiatives. Full references are available in the PDF version.